to Search the TCC website! On October 13, 1994 the Texas Cave Conservancy was officially started in New Braunfels, Texas. Bob Finger, Sandi Moerbe, Stan Moerbe, Gary Napper, Jack Ralph, Mike Walsh, Mike Warton and others started the Texas Cave Conservancy. The TCC supports recreational use, not abuse, where appropriate. Through the development of some cave preserves open for limited public use, the long term goal of cave protection can better be achieved. This non-member, non-profit, 501 (c) (3) Texas Corporation is dedicated to the protection of caves, cave life, and aquifers as related to caves. We work through public education, scientific research and cave management by assisting land developers, municipalities, other non-profit organizations and private land- owners in the protection and management of caves. 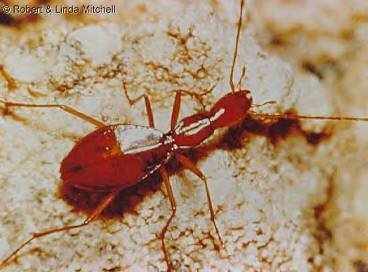 Currently, we are involved in cave management activities in over fifty cave preserves in the Austin, Texas area. Over one hundred and fifty caves are protected. There are over one thousand known caves in the urban areas throughout Texas. Some of the best caves have already been destroyed. As development continues, the goal of the Texas Cave Conservancy is to save as many caves as possible through the establishment of parks and preserves. Much of our income is from the design, construction, and the management of cave preserves. 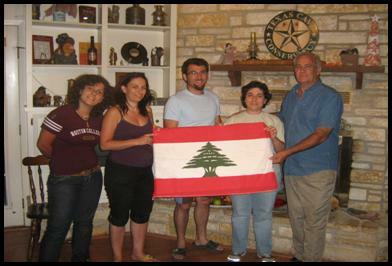 As a non-profit organization, our consultation is provided at no cost to the cave owner. 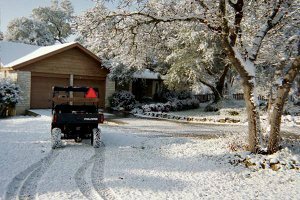 We are currently working with cavers and cave owners in Bexar, Edwards, Hays, Kinney, Kimble, Real, Sutton, Travis, Val Verde, Uvalde and Williamson Counties. We are, however, interested in cave protection throughout all of Texas. We work to protect caves through conservation easements, donations, leases, or purchase. 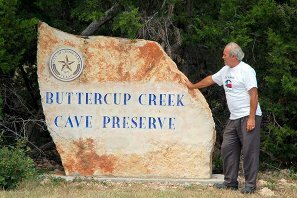 The Texas Cave Conservancy is a grass roots organization started by cavers. Please review our conservation policy, history, and activities. If you feel that Texas down-under is worth saving, you are invited to assist the Texas Cave Conservancy as Associates. The Texas Cave Conservancy is founded on October 13th, 1994. The TCC hosts the Texas Speleological Association meeting at Camp Wood, Texas, where a Memorandum of Agreement was signed with the Nueces Canyon Chamber of Commerce. This agreement later led to TCC management agreements on a number of caves including Palace Cave, (Kinney County), and Turkey Pen Cave (Real County). In October, the TCC was to focus of an article in the Texas Highways Magazine. 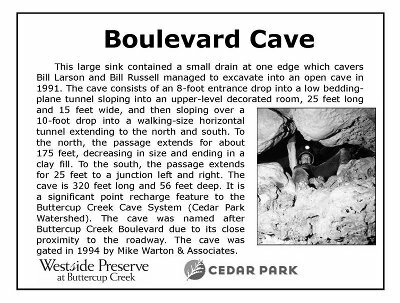 Later that same year, the TCC designed and built the Oak Brook Karst Preserve in Williamson County. This was the very first cave management contract obtained by the TCC. 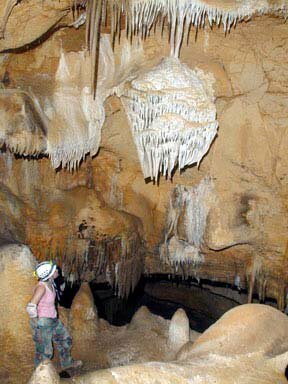 The TCC establishes a cave preserve at Webb Cave, in Alamo Village near Brackettville. This preserve was dedicated as the Webb-Shahan Cave Preserve with a number of family members present. The TCC acquires a conservation easement with the Brushy Creek Municipal Utility District for Beck Ranch Cave as well as nine other caves in Williamson County. 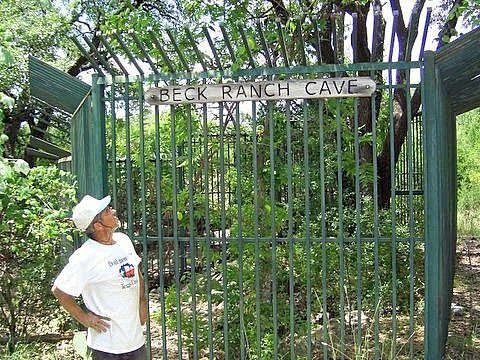 Later that year, the TCC designed and installed a high quality wrought iron fence around Beck Ranch Cave to prevent unauthorized access to the cave in an effort to protect the bats housed there. The TCC grows to more than 75 Associates. Sandi Moerbe retires as TCC Director. 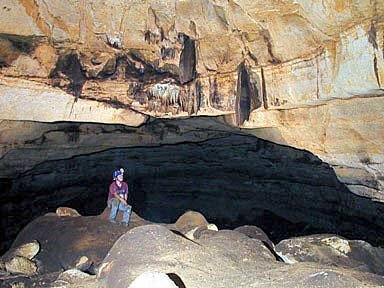 The TCC hosts a number of cave trips in West Texas. The TCC signs an agreement with Lumberman's Investment Corporation and the City of Cedar Park, Texas to manage thirty-two of the Westside Preserve caves, including Buttercup Creek Cave and Marigold Cave. Since that time TCC management of caves and preserves has now grown to include over fifty cave preserves containing more than one hundred and fifty caves. The TCC obtains a contract to manage the Hidden Glenn Cave Preserves in Round Rock, Texas. The TCC enhances the Hidden Glenn Cave Preserve with trails and a high quality entrance sign. The TCC works to expand the trails in the Westside Preserve. The TCC celebrates moving into their new headquarters in Cedar Park, Texas. The house along with three small caves and 4.25 acres adds great value to the TCC. 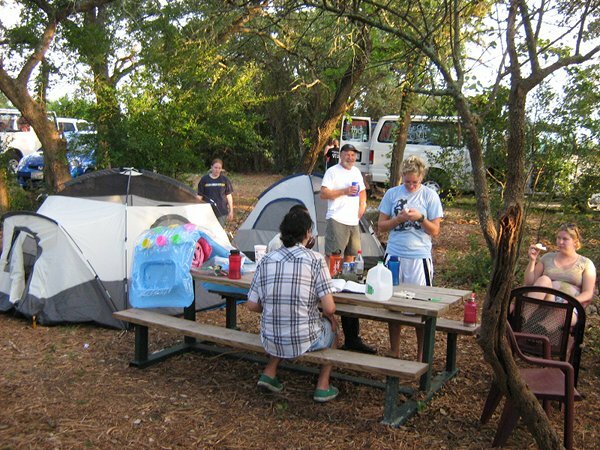 In addition to having a campground on the property, the land serves as a home for the TCC Library and Meeting Room. The TCC obtains a contract to manage the 109 acre Discovery Well track in Cedar Park, Texas. The TCC is also hired that year to conduct fire ant control activities at the Big Tree Cave Preserve and the Chaos Cave Preserve. The TCC now grows to more than 125 Associates. 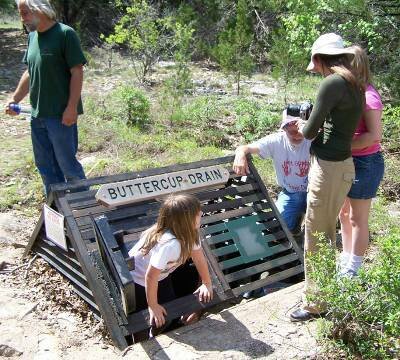 The Texas Cave Management Association bought Pumpkin and Deep Cave in Edwards County, Texas. The TCC assists the TCMA with the purchase by providing a significant monthly contribution to the TCMA. 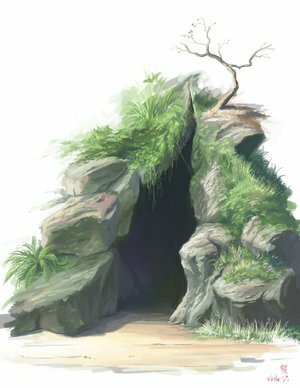 On Saturday, April 16, the TCC hosts Austin's very first CAVE DAY, an event open to the public. Over 250 members of the community in Austin attend despite rain, possible hail, and the threat of tornados. 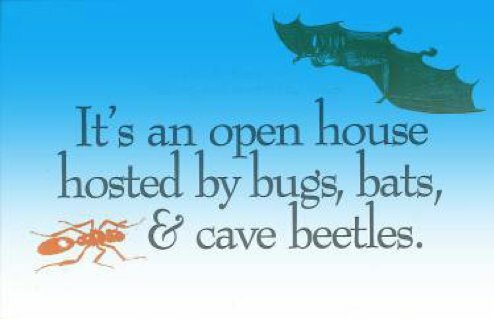 The TCC introduces the characters Ricky and Rebecca Rhadine (beetle) in order to educate young children in the Austin area about the importance of saving our precious cave resources. First CAVE DAY Radio message. With the assistance of a grant from Sandi Moerbe, the TCC converts a 500 square foot garage at the TCC Headquarters into a brand new multifunctional meeting room and party place. 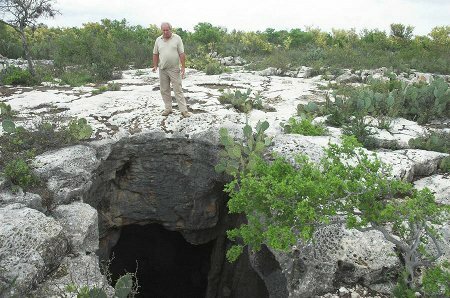 The TCC web site is launched by Webmaster George Nincehelser with the official web address of www.texascaves.org. Steve Gutting is elected TCC Director. The TCC starts working with the owner of the Discovery Well tract to transfer management of that $10,000,000 cave preserve property to the City of Cedar Park. The TCC obtains four grants in order to assist in reaching our goals. 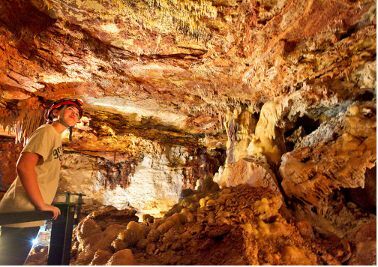 One grant will be used to develop Avery Ranch Cave and Dies Ranch Treasure Cave into educational show caves. Work is currently underway on the project. The second grant is to develop cave related brochures and other materials for the biannual event - CAVE DAY. 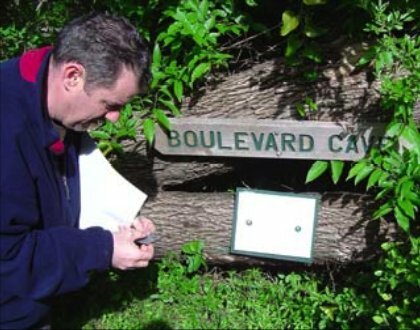 The third grant is to design and install 45 educational signs for the caves in the Westside Preserve. Open year round, the Westside Preserve offer an opportunity to learn about caves and to enjoy nature. The fourth grant is from the Bubble Cave Conservancy of West Virginia, for the purpose of building an outdoor shower for cavers at the TCC Headquarters. Bob Finger and Jack Ralph retire as TCC Directors. Gordon Birkhimer and Donna Mosesmann are elected new TCC Directors. The TCC is requested to design a cave preserve at the Buzz's Old Gold Cave site at Avery Ranch. 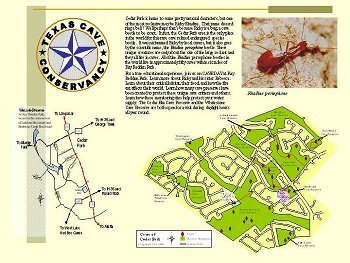 The site design and map is approved by the City of Austin and the cave preserve development was started the following year. The TCC headquarters serves as host for a four day planning session of the National Cave Rescue Association. Negotiations started to transfer management of the 109-acre Discovery Well tract from TEXDOT to the City of Cedar Park. Hike and bike trails will be developed on this property for use by the public once approval from the U.S. Fish & Wildlife Service has been received. The TCC has grown to more than 150 Associates. Mike Walsh is hired as the TCC President, the conservancy's first full-time employee. 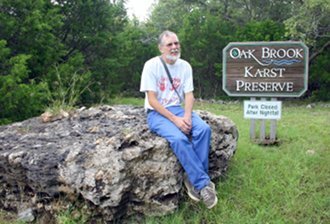 On March 3, Avery Ranch Cave becomes the first cave "owned" by the Texas Cave Conservancy. The TCC has plans to will develop Avery Ranch Cave as an educational show cave available for public visitation at no charge. May 16, the TCC was given our second cave, the Dies Ranch Treasure Cave. This cave will be used as a vertical training site. It will also be used in CAVE DAY activities in 2008. In addition to this, the TCC will take on the management of six caves in the Deer Creek Development in Cedar Park, Texas. One of the caves is B.A.B.E pit. This cave will be used as a CO2 (Carbon DiOxide) study cave. These two projects will require a great deal of work and volunteer effort in order to ready them for public use. Mike Walsh presented a talk at the 2006 NSS Convention on his work with developers that acquire caves. He was invited to the initial formal meeting of the NSS Partnership Building Forum. This is a group of NSS member that are city planners. Walsh compiled the first national list of counties that have caves and heavy development. With this list, the Partnership Building Forum can contact the governmental groups in these counties. The Ricky and Rebecca Rhadine (beetle) audiotape is developed for children for CAVE DAY 2006. We tell the children that they live in Mushroom Cave. A caver calls into the cave to see if they are there, lowers a microphone and Ricky and Rebecca tell their story. The recording is then played for the children. 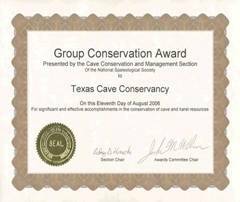 The Texas Cave Conservancy was awarded the 2006 National Speleological Society Group Cave Conservation - Cave Management Award at the NSS Banquet, August 11, 2006, in Bellingham, Washington. Over fifty Associates from around the country represented the Texas Cave Conservancy at the NSS Banquet. Thanks goes out to all of the 200 TCC Associates in Texas and around the country that helped us to receive this, the NSS Group Conservation award. February 23-25, the first TCC Winter Conference was held at the TCC Headquarters. It features caving, tours, educational workshops and a guest speaker following the Saturday night dinner. This event is set up to work with new cavers. Over 90 cavers attended this new event. 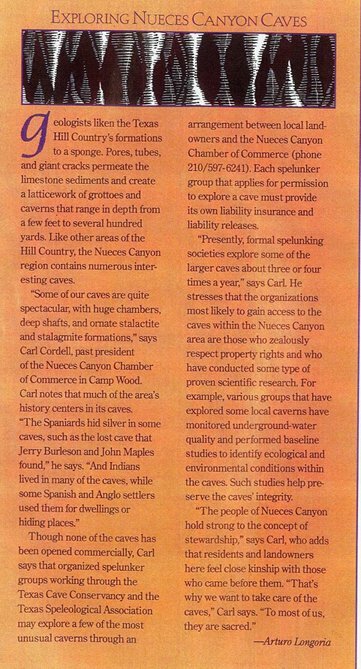 Cave management and cave conservation is featured. At the 2007 NSS Convention, TCC President, Mike Walsh helped set up a national speakers bureau that would work with governmental agencies in their area. In addition, information was gathered concerning the counties, national wide, where developers are buying land with caves on that land. The total number of counties nation wide (excluding Florida) is fewer than 100. The TCC Headquarters is open to cavers on a year round basis. Water and electricity was added to the TCC Campground. In addition, a new shower was built for cavers staying at the TCC campground. On October 11, 2007, the TCC presented a poster on the Texas System for Urban Cave Management at the 2007 National Cave Management Symposium in St. Louis, Missouri. In January, the management of the ten- million dollar, 104-acre Discovery Well Cave Preserve property was transferred to the City of Cedar Park, Texas. The TCC will manage the cave preserve. On February 22-24 the second TCC Winter Conference was held at the TCC Headquarters. Camping, caving, tours, workshops and a party with a great meal all added to the event. Cavers greatly enjoyed Bill Larson's cave tours. This year over 80 cavers attended the event. In April 2008, the NSS Partnership Forum had a table at the National Convention of the American Planning Association in Las Vegas. Over 5000 cities were represented and a number of cave related contacts were made. 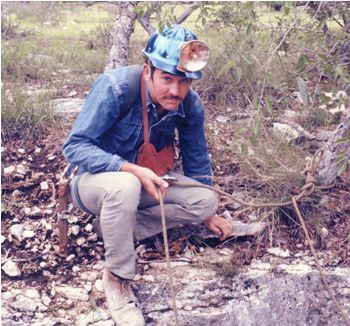 Mike Walsh, President of the Texas Cave Conservancy, was instrumental in booth planning details and logistics. 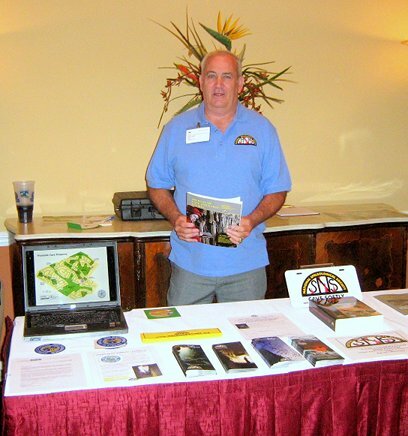 He helped man the booth and coordinated behind-the-scenes booth activities such as Forum business cards, NSS literature, contact information sheets, Partnership Forum staff shirts, and CDs with pertinent Karst Partnership Forum information. The Texas Cave Conservancy sponsored Kriste Lindberg's air travel to the conference so she could participate in the booth. TCC Director Gordon Birkhimer assisted as well. The Westside Preserve, used during the karst session. The resulting presentation will be available for future use. This can be viewed in the Presentation section on this web site. The Cave Counties Threatened by Development list was updated. Currently, nationwide, there are 93 counties identified where developers have acquired land with caves (excluding Florida). Over 75 cavers attended this third annual meeting. For three years in a row this has been the second best attended Texas caver event. The Texas Cavers Reunion is still the big one. In addition to the regular caving introduction workshop, this year, the TCC started the Cave Management - Cave Conservation Workshop. Cavers can work with experts, both in the field and in the caves, to obtain training. Following the completion of forty hours in the field, a TCC Certificate will be issued. 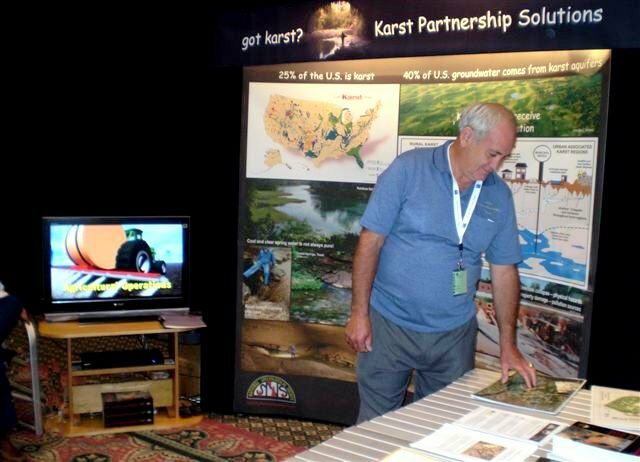 TCC associates Kriste Lindberg and Mike Walsh ran the NSS Karst Partnership Forum table. In addition, TCC President Mike Walsh presented a talk "Management of cave related features in the Westside Cave Preserve, Cedar Park, Texas." 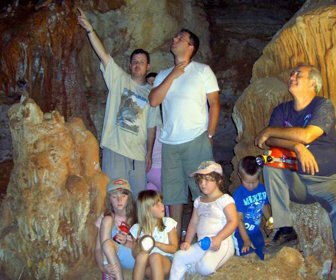 This was the first year that the TCC provided public entry into both the Avery Ranch Cave and the Dies Ranch Treasure Cave at the CAVE DAY event. The TCC invited the cavers on the way to the International Congress of Speleology to stop by the TCC Headquarters for a weekend of camping, caving, cave management tours and a Saturday night Party. 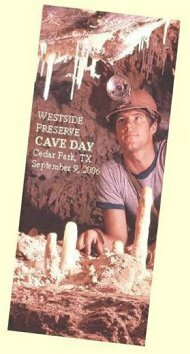 The TCC provided information on free cave related activities in the Austin, Texas area. In addition, the TCC hosted the Wednesday International Field Trip at the TCC headquarters and at caves under TCC management. Despite over three inches of rainfall, almost 200 visitors went into the two TCC owned caves, Avery Ranch Cave and the Dies Ranch Treasure Cave. 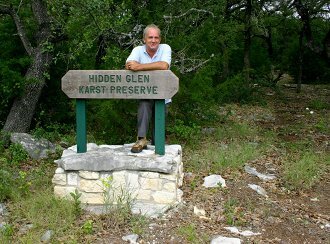 The TCC installed twenty-five educational signs at the Discovery Well Cave Preserve (Cedar Park) and at the Highland Horizons sub-division (Round Rock). Nationwide, the TCC now has over 200 associates. January 12, the new TCC website went on line. Based on general concepts and content by Mike Walsh, the website's initial construction was developed by Martha Meacham, and is currently maintained by Christopher Francke. February 20-24, TCC Associate Mike Warton installed fifteen cave related educational signs at the Highlands Horizons Sub-division located in Round Rock, Texas. This development will serve as a model for a proposed fifteen- mile cave related trail system located along Hwy 620, Round Rock, Texas. 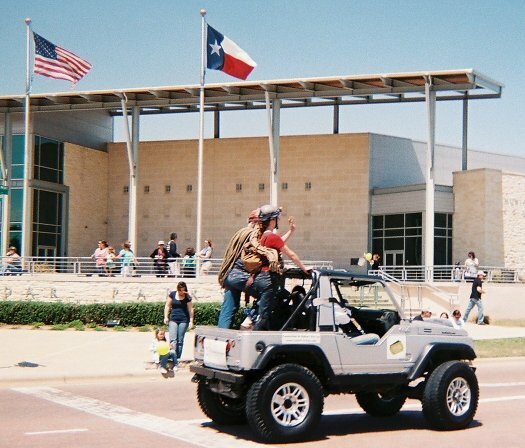 On March 1, the TCC delivered the 2009 Discovery Well Cave Preserve Report to the Texas Department of Transportation and the U. S. Fish & Wildlife Department. The TCC hosted the Texas Speleological Association Convention, March 26-28. Camping, caving, talks, vendor sales and a great Saturday night meal and party all made it a successful event. Over two hundred Texas Cavers took part in the three - day event. The Texas Cave Management Association raised over $3000 in the TCMA Breakfast and Saturday night Auction. On Saturday April 10, cavers Bill and Jeanette Larson represented the Texas Cave Conservancy in the City of Cedar Park, Heritage Day Parade. Despite an 80% chance of rain, over 300 visitors took part on the April 17, TCC CAVE DAY. New TCC Associates, Christopher Francke and Leslie Bell joined Curtis Bullard, Bill and Jeanette Larson in hosting the event. On September 1, 2010, the Texas Cave Conservancy received a contract to manage the Williamson County Cave Preserves. Currently over twenty caves are involved. The TCC completed and delivered the initial report on the conditions of the Cave Preserves to the county. We look forward to working with them in the protection of the caves, cave life and the aquifer as related to caves. 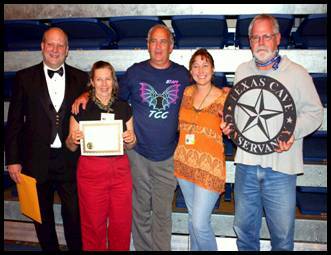 On September 5, 2010, Texas Cave Conservancy President-Mike Walsh & Lynda Beck were married at the TCC Headquarters. In lieu of gifts, donations were made toward the purchase of two flash heaters showers for the headquarters. They were purchased, installed and used. 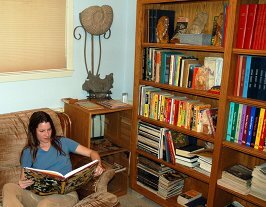 Visitors were able to enter a small new room in the TCC owned Dies Ranch Treasure Cave on the September 18, TCC CAVE DAY. New TCC Associates, Christopher Francke and Leslie Bell dug into the room just days before the event. In addition, the visitors were able to visit the Discovery Well Cave Preserve, the Dies Ranch Shelter Cave and the TCC owned Avery Ranch Cave. This year has been a busy one for the Texas Cave Conservancy and it is far from over. 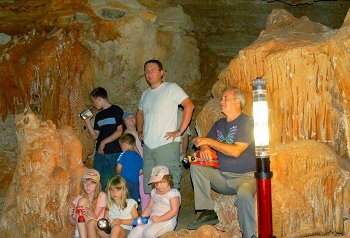 Last year we had over 800 visitors go into the TCC educational show cave, Avery Ranch Cave, on CAVE DAY. Since it was getting far too crowded, we made a commitment to add asecond deck to the cave before the next CAVE DAY. Work In Avery Ranch Cave-New Deck In order to be ready for CAVE DAY on April, 2012, we had Freddie Poer install a cedar deck base and we ordered the special mold resistant plastic decking from Canada. Freddie and his newwife, Martina Correa Mar installed the decking. We brought Spencer Woods in to do the welding of the vertical poles for the handrails. Avery Ranch Cave is now a first class educational show cave. Each year, in February, the TCC hosts this weekend event in Cedar Park, Texas. The 2012 TCC Winter Conference was held from February 24-26. It was a weekend of caving, camping, a cave digging workshop, a Saturday night party with a meal and guest speakers. Past speakershave included: Terry Rains, Ronnie Fiesler, Ron Kerbo and Mike Warton. This year, Logan McNatt and Mike Walsh had a presentation on the old Southwest Texas University Grotto. Christopher Francke organized a successful cave digging workshop in Dies Ranch Cave. Each year we have had approximately 75-100 cavers attending and 2012 was no exception. The TCC received a telephone call from Sylvia Pope with the City of Austin Watershed Department. She asked if they could have a few television stations out to Avery Ranch Cave to promote the National Groundwater Week. 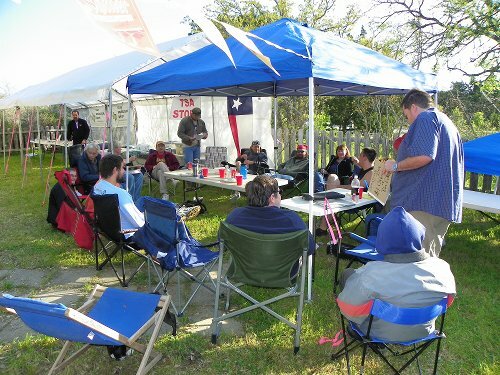 On March 13, 2012, every Television Station in Austin and many of the newspapers showed up at Avery Ranch Cave. The TCC President, Mike Walsh was even interviewed live from within the cave. The resulting publicity created a situation where we had to deal with incredible numbers of visitors on CAVE DAY. We knew we were in over our heads when we saw all the television and the newspaper publicity that week. 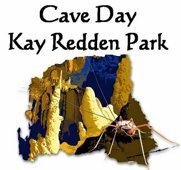 We had over 30,000 visits to our web site in the twenty-eight days prior to CAVE DAY on April 14th. The Avery Ranch Cave was in fairly good shape, however, we had a good deal of work to make the Dies Ranch Treasure Cave safer for visitors. Walter Beck, Martina Correa Mar, Freddie Poer and Mike Walsh installed four metal safety barriers in order to make the cave safer for the large numbers that we expected. CAVE DAY- April 14, 2012 The big day arrived and we had not overestimated the numbers created by the media storm. We passed out tickets and we had 1800+ visitors in Avery Ranch Cave and 600+ visitors in Dies Ranch Cave. 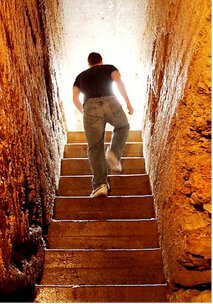 These are not large caves and everyone going down the stairs and or ladders have to leave the cave the same way. We could not have made it without the following volunteers: Lynda Beck, Walter Beck, Leslie Bell, Martina Correa Mar, Christopher Francke, Bob Heart, Freddie Poer, Mike Walsh and Cindy West. 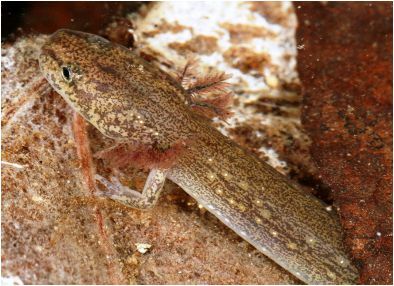 The Jollyville Plateau Salamander is a candidate for the U. S. Fish & Wildlife listing as an endangered species. The TCC works to protect caves, cave life and the aquifers related to caves. Toward that end, we are developing a monitoring plan that will help identify, monitor, and mitigate potential contamination situations concerning the Buttercup Creek Watershed. Within this narrow watershed, there are miles of cave passage. It is in the interest of the City of Cedar Park and others to work toward the protection of this watershed that leads to Cypress Creek and on to Lake Travis. The TCC will continue to work with interested parties on a watershed protection plan. 2013 has been a year of great change for the Texas Cave Concervancy. It was necessary for the TCC to move from the old ranch style headquarters on Park Street over to a newly built office 1000 feet to the south. When the owners of the 4.1 acres of the cave preserve sell it, we would like to work with the new owners. Under the U. S. Fish & Wildlife Regulations it will remain a Cave Preserve in order to protect the cave related endangered species. Contact us if you would like to own the 4.1 acre Cave Preserve and we could fill you in on this house and land. When the new TCC Website went on line in April, 2010, we had no idea that it could generate as much interest as it has. We reached the 1,000,000 visitor mark by the first day of the National Speleological Society Convention in Pennsylvania in July of 2013. We must thank the following cavers for their assistance in the creation of the TCC Website: Christopher Francke, Martha Meacham, George Nincehelser and Mike Walsh. Check us out at Texascaves.org. When the TCC was started in 1994, one of the goals was to have caver access to over 250 caves. Through TCC ownership, management contracts, and private access, we now have reached that goal! The TCC will provide cavers with information on forming new Cave Conservancies. In addition, the TCC will assist cavers that seek to work with Developers that have obtained land with caves. With almost 100 counties identified, this represents opportunities for cavers to own or manage caves currently on land acquired by developers. Each year, the Texas Cave Conservancy monitors caves and produces reports outlining our cave management activities at several sites. The 2008 Discovery Well Cave Preserve Report is available. The Texas Cave Conservancy will continue to work with cavers, cave owners, governmental agencies and the public to protect caves, cave life and the aquifer as related to caves. We welcome your support in the protection of caves, Texas natural treasures. 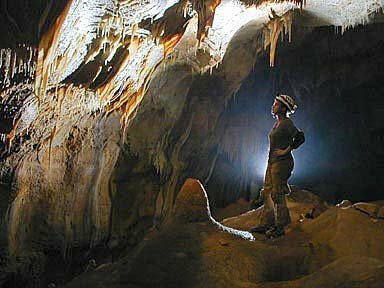 It is registered with the state of Texas as a non-profit corporation and is a conservancy of the National Speleological Society. Copyright © 1994-2014 Texas Cave Conservancy, Incorporated. All rights reserved.